Buying and Selling online is where it’s at. The world of eCommerce - or as the Temando team call it, the world of ‘dot com’ - gives you the ability to reach a broad range of potential customers. The question is: how do you make these people who browse the internet your customer, and how do you keep them? Below are a few best practices for you to keep in mind when creating your dot com space. Recently, after searching for an outdoor setting online and settling on one I liked, I was shocked to get to the checkout and be slogged with a $200+ shipping cost. This was almost the cost of the product itself. It is important to be upfront with your shipping costs. Regardless of whether your store offers flat rate or dynamic shipping cost (i.e. shipping cost is dependent on customer’s postcode), cost needs to be clearly communicated with the user. Adding a shipping calculator at a product level assists in this transparency. Communicating shipping costs is key, but so is providing the customer with options. Some customers may want to pay for a premium service to receive their goods earlier whilst other may be happy with a slower, ‘general road’ service. Temando allows the comparison of various freight services whether it be same day, overnight or general road. Anaconda's checkout with shipping calculator for the customer to calculate costs prior to checkout. Like a bricks and mortar store, your website needs to be well laid out and aesthetically appealing to drive customers to the check out. Cluttered product pages with too much going on can be distracting and lead to unconverted sales. Use the pages to highlight the product and its features, but don’t get too crazy. Animations and flashing images can often distract from the product. And not all devices show flash! Be precise with product descriptions. Visually, clean crisp lines are ideal. Customers are going to be deterred from buying if the process is complicated. Ensure you map this process prior to development. This motto is across the board and not industry selective, so don’t forget to keep it simple, stupid. Selling items intangibly can be a difficult task if quality images are not provided. The way you present your items can get a visitor across the line and convert them to a buyer. Having pictures play a major role means that you should invest in the images you have displayed on your site. Keeping the images consistent and well-presented will encourage sales. When it comes to online shopping, pictures play a major role. Feather and Buzz, homewares website- is a great example of good quality images. 4. Username OR Email Address? Allowing your users to use your website with an email address rather than a username is preferable. Usernames can be difficult to remember, and can be a pet peeve of the buyer. When they are buying a product, allow users to create their profile with an email address. Despite online shopping being widely accepted as a retail environment, there are still some hesitations of customers on the legitimacy of websites. Displaying contact details clearly helps to reinforce confidence in the consumer to purchase from your website. This does not necessarily mean providing your contact number but having a clear contact page - whether that is via phone or email. Should a customer have questions or issues they can easily and confidently contact you. Bing Lee have their contact details clearly visible in the header, as well as live chat. Give the customer the ability to add and remove items from the cart page. From personal experience, it can be a frustrating and sometimes a negative experience when you are required to go back or refresh the page when you simply want to edit the contents of the cart. Ksubi allows you to remove or update the quantities of the products in your shopping cart. Whilst not a key component of a website, giving users the option of a search field can be viewed as beneficial. Some users come directly to your site in search of a particular product. Rather than hunting your website, this option allows them to search for the product directly. This search function should be inserted in the header of the page (in most cases on the right hand side of the header). 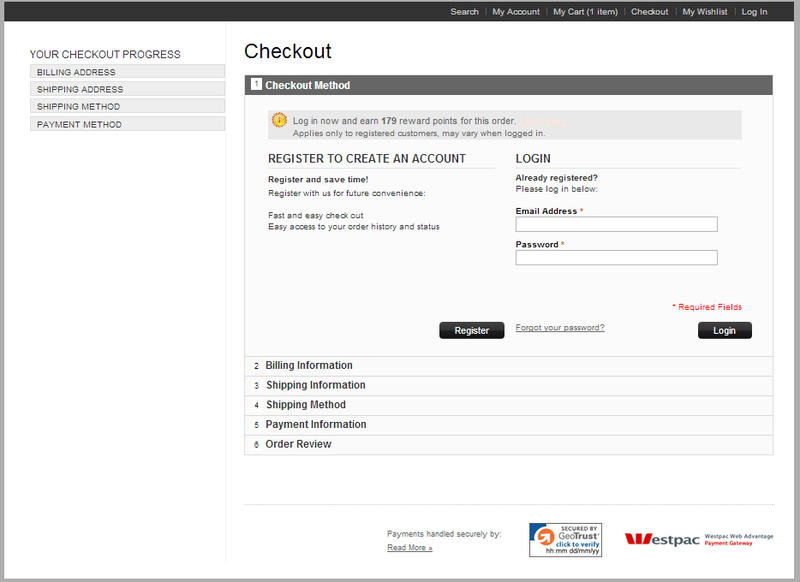 Harvey Norman has a clearly visibly search bar for customers to search the product database. A great addition to a website is ‘Recommended Item’ feature, if executed correctly. A bad feature for a website is a ‘recommended item’ feature that displays irrelevant products. Linking purchased products and providing similar ones to tempt the consumer further is another way of engaging with your consumer. The Iconic make use of the recommended item feature- love wedges! Hidden charges can leave your consumer with a negative view of your eCommerce site. 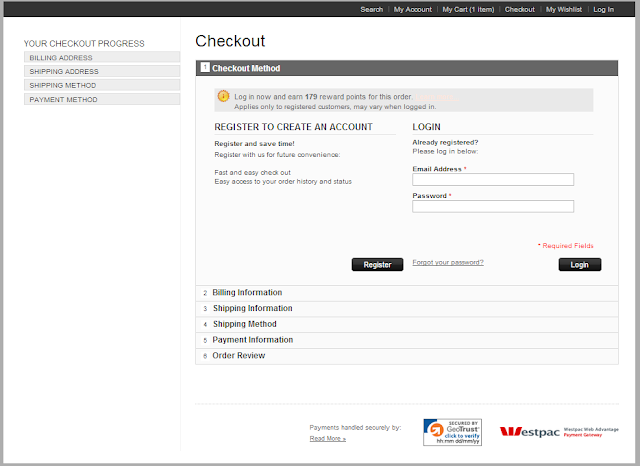 If these charges are added at the checkout they are generally the last part of the interaction with your site. Providing clarity with product and payment methods upfront will avoid this negative connotation. There should be no hidden charges - it’s easier to retain a customer than gain a new one. Not everyone feels comfortable paying by credit card, so ensure your online store has more than one method of payment. Research the payment options available in your sector and area (Australia, US, Europe). Remove any barriers to purchase by giving your customers payment options. Supercheap Auto offer Credit Card & PayPal as payment methods. Temando’s data shows that a one-page checkout process increases conversions. Only ask for the important and necessary information – asking for irrelevant information will frustrate the customer and can lead to shopping cart abandonment. Ensure that previously entered data is automatically entered when the customer has logged in (e.g. shipping address). Your one-page checkout should include shipping address, delivery options and payment gateway. Tony Bianco has a sleek and clear checkout. The booming uptake of handheld devices such as tablets and smart phones makes online shopping much more easily accessible. No longer do people just browse the internet from their desktop, it’s often done from their smart device whilst on the bus or watching TV. Make sure your website is responsive to the varying devices. Keep in mind that these devices are touch screen so links and buttons should be designed to accommodate this. Hot tip from around the traps - make sure you can still access the normal website from the mobile version! 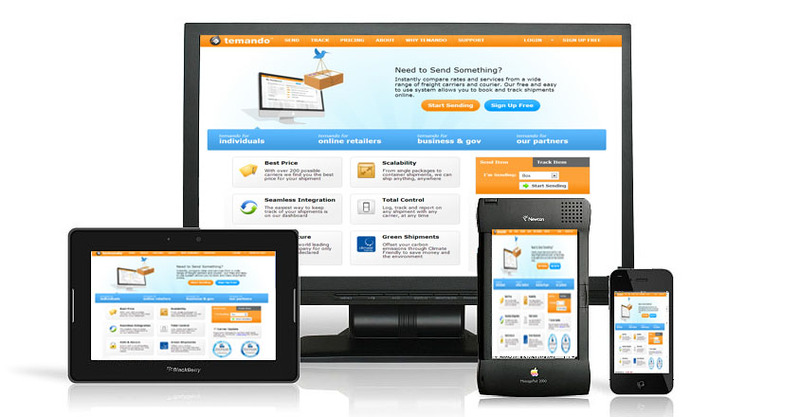 Responsive websites are becoming the norm and the necessary. These points are only skimming the surface of the best practices for your online store. The online environment is a quickly adapting one. eCommerce site owners should continue to keep their fingers on the pulse and up to date. Give us your feedback on what has worked for your site - or maybe what didn’t work so well!